Saffron Garden Cottages is located in the small, quiet village of Horndon on the Hill backing on to fields. We are a family run business, providing cattery boarding services, where we treat our visitors in the same manner as our cats, with love, and affection. Our pens have both an internal and external area, that our visitors have free range. We are happy to give medication, with several of our regular visitors requiring vaccinations for diabetes, to which I am happy to administer having served in the Royal Army Medical Corp. Our drop and collection is extremely flexible, and by appointment, but we have cats being dropped at 7am and collected as late as 11pm (when those flights are delayed). 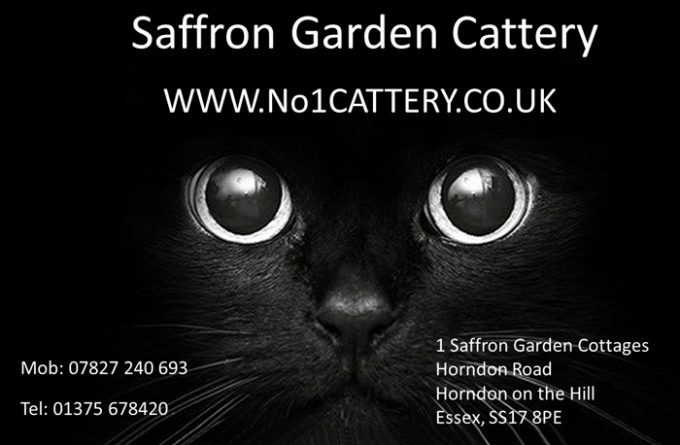 For more information about Saffron Garden Cattery, you can visit them in person, visit their website, telephone or send them an email (if available) using the form below.